Winter is the coldest season of the year in polar and temperate zones (winter does not occur in most of the tropical zone). It occurs after autumn and before spring in each year. Winter is caused by the axis of the Earth in that hemisphere being oriented away from the Sun. Different cultures define different dates as the start of winter, and some use a definition based on weather. When it is winter in the Northern Hemisphere, it is summer in the Southern Hemisphere, and vice versa. In many regions, winter is associated with snow and freezing temperatures. The moment of winter solstice is when the Sun's elevation with respect to the North or South Pole is at its most negative value (that is, the Sun is at its farthest below the horizon as measured from the pole). The day on which this occurs has the shortest day and the longest night, with day length increasing and night length decreasing as the season progresses after the solstice. The earliest sunset and latest sunrise dates outside the polar regions differ from the date of the winter solstice, however, and these depend on latitude, due to the variation in the solar day throughout the year caused by the Earth's elliptical orbit (see earliest and latest sunrise and sunset). The English word "winter" comes from the Proto-Indo-European root "wend," relating to water. The tilt of the Earth's axis relative to its orbital plane plays a large role in the formation of weather. The Earth is tilted at an angle of 23.44° to the plane of its orbit, causing different latitudes to directly face the Sun as the Earth moves through its orbit. This variation brings about seasons. When it is winter in the Northern Hemisphere, the Southern Hemisphere faces the Sun more directly and thus experiences warmer temperatures than the Northern Hemisphere. Conversely, winter in the Southern Hemisphere occurs when the Northern Hemisphere is tilted more toward the Sun. From the perspective of an observer on the Earth, the winter Sun has a lower maximum altitude in the sky than the summer Sun. During winter in either hemisphere, the lower altitude of the Sun causes the sunlight to hit the Earth at an oblique angle. Thus a lower amount of solar radiation strikes the Earth per unit of surface area. Furthermore, the light must travel a longer distance through the atmosphere, allowing the atmosphere to dissipate more heat. Compared with these effects, the effect of the changes in the distance of the Earth from the Sun (due to the Earth's elliptical orbit) is negligible. The manifestation of the meteorological winter (freezing temperatures) in the northerly snow–prone latitudes is highly variable depending on elevation, position versus marine winds and the amount of precipitation. For instance, within Canada (a country of cold winters), Winnipeg on the Great Plains, a long way from the ocean, has a January high of −11.3 °C (11.7 °F) and a low of −21.4 °C (−6.5 °F). In comparison, Vancouver on the west coast with a marine influence from moderating Pacific winds has a January low of 1.4 °C (34.5 °F) with days well above freezing at 6.9 °C (44.4 °F). Both places are at 49°N latitude, and in the same western half of the continent. A similar but less extreme effect is found in Europe: in spite of their northerly latitude, the British Isles have not a single non-mountain weather station with a below-freezing mean January temperature. Meteorological reckoning is the method of measuring the winter season used by meteorologists based on "sensible weather patterns" for record keeping purposes, so the start of meteorological winter varies with latitude. Winter is often defined by meteorologists to be the three calendar months with the lowest average temperatures. This corresponds to the months of December, January and February in the Northern Hemisphere, and June, July and August in the Southern Hemisphere. The coldest average temperatures of the season are typically experienced in January or February in the Northern Hemisphere and in June, July or August in the Southern Hemisphere. Nighttime predominates in the winter season, and in some regions winter has the highest rate of precipitation as well as prolonged dampness because of permanent snow cover or high precipitation rates coupled with low temperatures, precluding evaporation. Blizzards often develop and cause many transportation delays. Diamond dust, also known as ice needles or ice crystals, forms at temperatures approaching −40 °C (−40 °F) due to air with slightly higher moisture from above mixing with colder, surface-based air. They are made of simple hexagonal ice crystals. The Swedish meteorological institute (SMHI) defines winter as when the daily mean temperatures are below 0 °C (32 °F) for five consecutive days. According to the SMHI, winter in Scandinavia is more pronounced when Atlantic low-pressure systems take more southerly and northerly routes, leaving the path open for high-pressure systems to come in and cold temperatures to occur. As a result, the coldest January on record in Stockholm, in 1987, was also the sunniest. Accumulations of snow and ice are commonly associated with winter in the Northern Hemisphere, due to the large land masses there. In the Southern Hemisphere, the more maritime climate and the relative lack of land south of 40°S makes the winters milder; thus, snow and ice are less common in inhabited regions of the Southern Hemisphere. In this region, snow occurs every year in elevated regions such as the Andes, the Great Dividing Range in Australia, and the mountains of New Zealand, and also occurs in the southerly Patagonia region of South Argentina. Snow occurs year-round in Antarctica. In the Southern Hemisphere winter extends from June to September, pictured in Caxias do Sul in the southern highlands of Brazil. In the Northern Hemisphere, some authorities define the period of winter based on astronomical fixed points (i.e. based solely on the position of the Earth in its orbit around the Sun), regardless of weather conditions. In one version of this definition, winter begins at the winter solstice and ends at the vernal equinox. These dates are somewhat later than those used to define the beginning and end of the meteorological winter – usually considered to span the entirety of December, January, and February in the Northern Hemisphere and June, July, and August in the Southern. Astronomically, the winter solstice, being the day of the year which has fewest hours of daylight, ought to be in the middle of the season, but seasonal lag means that the coldest period normally follows the solstice by a few weeks. In some cultures, the season is regarded as beginning at the solstice and ending on the following equinox – in the Northern Hemisphere, depending on the year, this corresponds to the period between 21 or 22 December and 19, 20 or 21 March. Also, many mainland European countries tended to recognize Martinmas or St. Martin's Day (11 November), as the first calendar day of winter. The day falls at the midpoint between the old Julian equinox and solstice dates. Also, Valentine's Day (14 February) is recognized by some countries as heralding the first rites of spring, such as flowers blooming. In Chinese astronomy and other East Asian calendars, winter is taken to commence on or around 7 November, with the Jiéqì (known as 立冬 lì dōng—literally, "establishment of winter"). The three-month period associated with the coldest average temperatures typically begins somewhere in late November or early December in the Northern Hemisphere and lasts through late February or early March. This "thermological winter" is earlier than the solstice delimited definition, but later than the daylight (Celtic) definition. Depending on seasonal lag, this period will vary between climatic regions. Cultural influences such as Christmas creep may have led to the winter season being perceived as beginning earlier in recent years, although high latitude countries like Canada are usually well into their real winters before the December solstice. Since by almost all definitions valid for the Northern Hemisphere, winter spans 31 December and 1 January, the season is split across years, just like summer in the Southern Hemisphere. Each calendar year includes parts of two winters. This causes ambiguity in associating a winter with a particular year, e.g. "Winter 2018". Solutions for this problem include naming both years, e.g. "Winter 18/19", or settling on the year the season starts in or on the year most of its days belong to, which is the later year for most definitions. 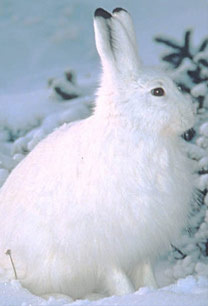 The snowshoe hare, and some other animals, change color in winter. Ecological reckoning of winter differs from calendar-based by avoiding the use of fixed dates. It is one of six seasons recognized by most ecologists who customarily use the term hibernal for this period of the year (the other ecological seasons being prevernal, vernal, estival, serotinal, and autumnal). The hibernal season coincides with the main period of biological dormancy each year whose dates vary according to local and regional climates in temperate zones of the Earth. The appearance of flowering plants like the crocus can mark the change from ecological winter to the prevernal season as early as late January in mild temperate climates. Migration is a common effect of winter upon animals, notably birds. However, the majority of birds do not migrate—the cardinal and European robin, for example. Some butterflies also migrate seasonally. Hibernation is a state of reduced metabolic activity during the winter. Some animals "sleep" during winter and only come out when the warm weather returns; e.g., gophers, frogs, snakes, and bats. Some animals store food for the winter and live on it instead of hibernating completely. This is the case for squirrels, beavers, skunks, badgers, and raccoons. Resistance is observed when an animal endures winter but changes in ways such as color and musculature. The color of the fur or plumage changes to white (in order to be confused with snow) and thus retains its cryptic coloration year-round. Examples are the rock ptarmigan, Arctic fox, weasel, white-tailed jackrabbit, and mountain hare. Some fur-coated mammals grow a heavier coat during the winter; this improves the heat-retention qualities of the fur. The coat is then shed following the winter season to allow better cooling. The heavier coat in winter made it a favorite season for trappers, who sought more profitable skins. Snow also affects the ways animals behave; many take advantage of the insulating properties of snow by burrowing in it. Mice and voles typically live under the snow layer. Some annual plants never survive the winter. Other annual plants require winter cold to complete their life cycle; this is known as vernalization. As for perennials, many small ones profit from the insulating effects of snow by being buried in it. Larger plants, particularly deciduous trees, usually let their upper part go dormant, but their roots are still protected by the snow layer. Few plants bloom in the winter, one exception being the flowering plum, which flowers in time for Chinese New Year. The process by which plants become acclimated to cold weather is called hardening. 1683–1684, "The Great Frost", when the Thames, hosting the River Thames frost fairs, was frozen all the way up to the London Bridge and remained frozen for about two months. Ice was about 27 cm (11 in) thick in London and about 120 cm (47 in) thick in Somerset. The sea froze up to 2 miles (3.2 km) out around the coast of the southern North Sea, causing severe problems for shipping and preventing use of many harbours. 1739–1740, one of the most severe winters in the UK on record. The Thames remained frozen over for about 8 weeks. The Irish famine of 1740–1741 claimed the lives of at least 300,000 people. 1816 was the Year Without a Summer in the Northern Hemisphere. The unusual coolness of the winter of 1815–1816 and of the following summer was primarily due to the eruption of Mount Tambora in Indonesia, in April 1815. There were secondary effects from an unknown eruption or eruptions around 1810, and several smaller eruptions around the world between 1812 and 1814. The cumulative effects were worldwide, but were especially strong in the Eastern United States, Atlantic Canada, and Northern Europe. Frost formed in May in New England, killing many newly planted crops, and the summer never recovered. Snow fell in New York and Maine in June, and ice formed in lakes and rivers in July and August. In the UK, snow drifts remained on hills until late July, and the Thames froze in September. Agricultural crops failed and livestock died in much of the Northern Hemisphere, resulting in food shortages and the worst famine of the 19th century. 1887–1888, there were record cold temperatures in the Upper Midwest, heavy snowfalls worldwide, and amazing storms, including the Schoolhouse Blizzard of 1888 (in the Midwest in January), and the Great Blizzard of 1888 (in the Eastern US and Canada in March). In Europe, the winters of early 1947, February 1956, 1962–1963, 1981–1982 and 2009–2010 were abnormally cold. The UK winter of 1946–1947 started out relatively normal, but became one of the snowiest UK winters to date, with nearly continuous snowfall from late January until March. In South America the winter of 1975 was one of the strongest, with record snow occurring at 25°S in cities of low altitude, with registration of −17 °C (1.4 °F) in some parts of southern Brazil. In the eastern United States and Canada, the winter of 2013–2014 and the second half of February 2015 were abnormally cold. However, the winter of 2014–2015 did have a balmy December and a normal January. 1310–1330, many severe winters and cold, wet summers in Europe – the first clear manifestation of the unpredictable weather of the Little Ice Age that lasted for several centuries (from about 1300 to 1900). The persistently cold, wet weather caused great hardship, was primarily responsible for the Great Famine of 1315–1317, and strongly contributed to the weakened immunity and malnutrition leading up to the Black Death (1348–1350). 1600–1602, extremely cold winters in Switzerland and Baltic region after eruption of Huaynaputina in Peru in 1600. 1607–1608, in North America, ice persisted on Lake Superior until June. Londoners held their first frost fair on the frozen-over River Thames. 1622, in Turkey, the Golden Horn and southern section of Bosphorus froze over. 1690s, extremely cold, snowy, severe winters. Ice surrounded Iceland for miles in every direction. 1779–1780, Scotland's coldest winter on record, and ice surrounded Iceland in every direction (like in the 1690s). In the United States, a record five-week cold spell bottomed out at −20 °F (−29 °C) at Hartford, Connecticut, and −16 °F (−27 °C) in New York City. Hudson River and New York's harbor froze over. 1783–1786, the Thames partially froze, and snow remained on the ground for months. In February 1784, the North Carolina was frozen in Chesapeake Bay. 1794–1795, severe winter, with the coldest January in the UK and lowest temperature ever recorded in London: −21 °C (−6 °F) on 25 January. The cold began on Christmas Eve and lasted until late March, with a few temporary warm-ups. The Severn and Thames froze, and frost fairs started up again. The French army tried to invade the Netherlands over its frozen rivers, while the Dutch fleet was stuck in its harbor. The winter had easterlies (from Siberia) as its dominant feature. 1883–1888, colder temperatures worldwide, including an unbroken string of abnormally cold and brutal winters in the Upper Midwest, related to the explosion of Krakatoa in August 1883. There was snow recorded in the UK as early as October and as late as July during this time period. 1976–1977, one of the coldest winters in the US in decades. 1985, Arctic outbreak in US resulting from shift in polar vortex, with many cold temperature records broken. 2002–2003 was an unusually cold winter in the Northern and Eastern US. 2010–2011, persistent bitter cold in the entire eastern half of the US from December onward, with few or no mid-winter warm-ups, and with cool conditions continuing into spring. La Niña and negative Arctic oscillation were strong factors. Heavy and persistent precipitation contributed to almost constant snow cover in the Northeastern US which finally receded in early May. 2011 was one of the coldest on record in New Zealand with sea level snow falling in Wellington in July for the first time in 35 years and a much heavier snowstorm for 3 days in a row in August. 2011–2012, one of the warmest winters. Christmas Day 2011 was the warmest Christmas in Ireland, as observed by the Armagh Observatory. Humans are sensitive to cold, see hypothermia. Snowblindness, norovirus, seasonal depression. Slipping on black ice and falling icicles are other health concerns associated with cold and snowy weather. In the Northern Hemisphere, it is not unusual for homeless people to die from hypothermia in the winter. One of the most common diseases associated with winter is influenza. In Persian culture, the winter solstice is called Yaldā (meaning: birth) and it has been celebrated for thousands of years. It is referred to as the eve of the birth of Mithra, who symbolised light, goodness and strength on earth. In Greek mythology, Hades kidnapped Persephone to be his wife. 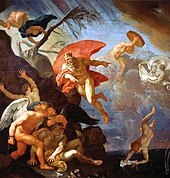 Zeus ordered Hades to return her to Demeter, the goddess of the Earth and her mother. However, Hades tricked Persephone into eating the food of the dead, so Zeus decreed that Persephone would spend six months with Demeter and six months with Hades. During the time her daughter is with Hades, Demeter became depressed and caused winter. In Welsh mythology, Gwyn ap Nudd abducted a maiden named Creiddylad. On May Day, her lover, Gwythr ap Greidawl, fought Gwyn to win her back. The battle between them represented the contest between summer and winter. ^ "Winter | Origin and meaning of winter by Online Etymology Dictionary". Archived from the original on 2 February 2015. Retrieved 2 February 2015. ^ "Canadian Climate Normals 1981–2010 Station Data for Winnipeg". Environment Canada. 25 September 2013. Archived from the original on 5 September 2016. Retrieved 8 August 2015. ^ "Canadian climate normals 1981–2010 Station Data for Vancouver". Environment Canada. 25 September 2013. Archived from the original on 18 May 2015. Retrieved 8 August 2015. ^ "UK climate - Station Map". Met Office. Archived from the original on 5 September 2015. Retrieved 8 August 2015. ^ Huttner, Paul (6 December 2007). "Instant meteorological winter". Minnesota Public Radio. Archived from the original on 8 June 2011. Retrieved 22 December 2011. ^ "Winter's Been Here Despite What the Calendar Says". NOAA Magazine. 22 December 2003. Archived from the original on 16 July 2011. Retrieved 22 December 2011. ^ Glossary of Meteorology (June 2000). "Diamond Dust". American Meteorological Society. Archived from the original on 3 April 2009. Retrieved 21 January 2010. ^ Kenneth G. Libbrecht (2001). "Morphogenesis on Ice: The Physics of Snow Crystals" (PDF). Engineering & Science (1): 12. Archived from the original (PDF) on 25 June 2010. Retrieved 21 January 2010. ^ "Vinter" (in Swedish). SMHI. Archived from the original on 25 March 2015. Retrieved 31 July 2015. ^ "Precipitation, Sunshine & Radiation for January 2015 (all-time records section)" (PDF) (in Swedish). SMHI. Retrieved 31 July 2015. ^ "Temperature & Wind – January 2015 (all-time records section)" (PDF) (in Swedish). SMHI. Retrieved 31 July 2015. ^ Ball, Sir Robert S (1900). Elements of Astronomy. London: The MacMillan Company. p. 52. ISBN 978-1-4400-5323-8. ^ Heck, Andre (2006). Organizations and strategies in Astronomy Volume 7. Springer. p. 14. ISBN 978-1-4020-5300-9. ^ Meteorological Glossary (Sixth ed.). London: HMSO. 1991. p. 260. ISBN 978-0-11-400363-0. ^ Første vinterdag Archived 29 June 2011 at the Wayback Machine. (2009). The Norwegian Meteorological Institute. Retrieved 31 August 2009. ^ Hamilton, Daniel (2 June 2009). "Images from around Australia on first day of Winter 2009". Abc.net.au. Archived from the original on 12 November 2012. Retrieved 23 May 2012. ^ Anderson, Earl R. (2003). Folk-Taxonomies in Early English. Madison, N.J.: Fairleigh Dickinson University Press. p. 219. ISBN 978-0-8386-3916-0. On St. Martin's day (11 November) winter begins, summer takes its end, harvest is completed. ...This text is one of many that preserves vestiges of the ancient Indo-European system of two seasons, winter and summer. ^ Michael Allaby (1999). "A Dictionary of Zoology". Archived from the original on 2 June 2013. Retrieved 30 May 2012. ^ Cormac O Grada (2009). Famine: A Short History. Princeton University Press. p. 23. ISBN 978-0-691-12237-3. ^ Booth, George (2007). "Winter 1947 in the British Isles". Weather. 62 (3): 61–68. Bibcode:2007Wthr...62...61B. doi:10.1002/wea.66. Archived from the original on 12 January 2012. Retrieved 22 December 2011. ^ Grant, Ash (1 February 2010). "Top 10 Worst Blizzards U.S. History". Top 10 Worst Blizzards U.S. History. Ash Grant. Retrieved 4 December 2014.